If you found the results of the bra size calculator shocking, you're not alone. Results from our Bra Size Project showed us that a majority of women underestimate their cup size. Which means that most woman are suffering from their bra fitting. Unfortunately, the prevalent bra sizing methods used by lingerie retailers are misleading. Brands also offer limited size ranges. This forces women to settle for a bra size that offers little support or an outright bad fit. The above represents the general consensus on bra sizing. A certain cup size does not mean a certain breast size. Cup sizing is not static, it has to be read in context with the band size. A 36D is not the same as a 30D. 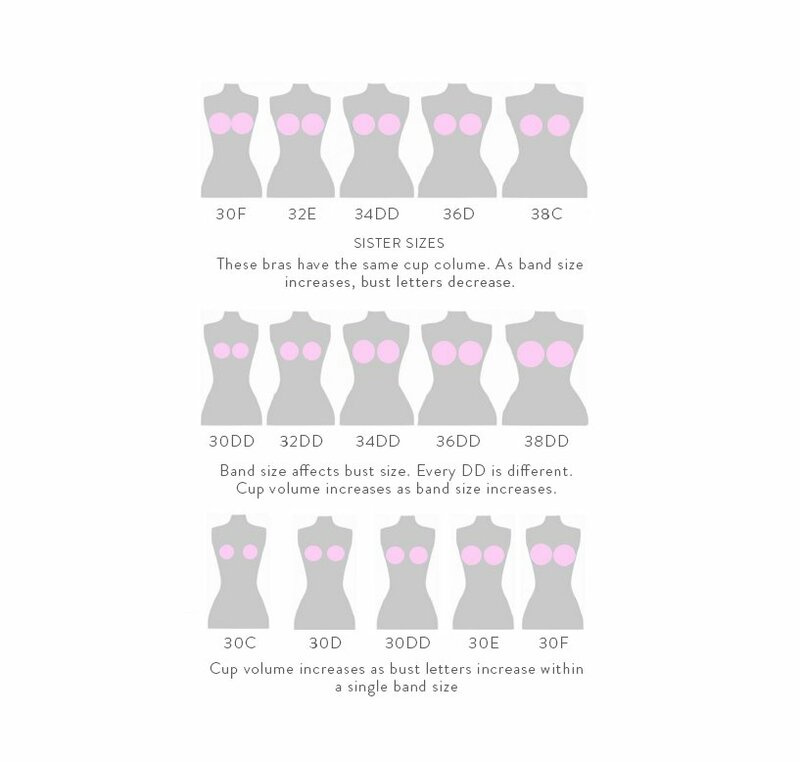 All the cup size is, is the difference (in inches) between your under bust and bust measurement. A "D cup" in itself doesn't mean anything. When you have both band size and cup size, you have a better picture of breast size. But bra sizing isn't rigid. There may be more than 1 size that would fit you. You may think you're a 34B, when in fact you are a 28DD. Both hold the same volume, but the 28DD is for a woman with a smaller frame than the 34B. This is sister sizing. Your breast size depends not just on cup size, but also on your band size. Sister sizes mean that they hold the same volume of breast. Below is a chart showing you the sister sizes. All the sizes listed on the same line are sister sizes. You will see that as you increase band size, the cup size goes down. Find your size, then take note of the sizes on the left and right of your size. When shopping for bras, you may want to try on these 2 cup sizes. The bra size on the left of your bra size will be tighter around the ribcage while the one on the right will be looser. The further away you go from your bra size, the less likely the bra will fit. Stick to the 2 bra sizes immediately on the left and right of your bra size. Brands will fit you in the range of sizes they carry. A bra fitting from a shop that only carries cup sizes A to D is likely to be misleading. The shop is not going to turn away a customer, and so will tell you that you will fit in a certain size. InvisiBras are different because it's a backless bra. 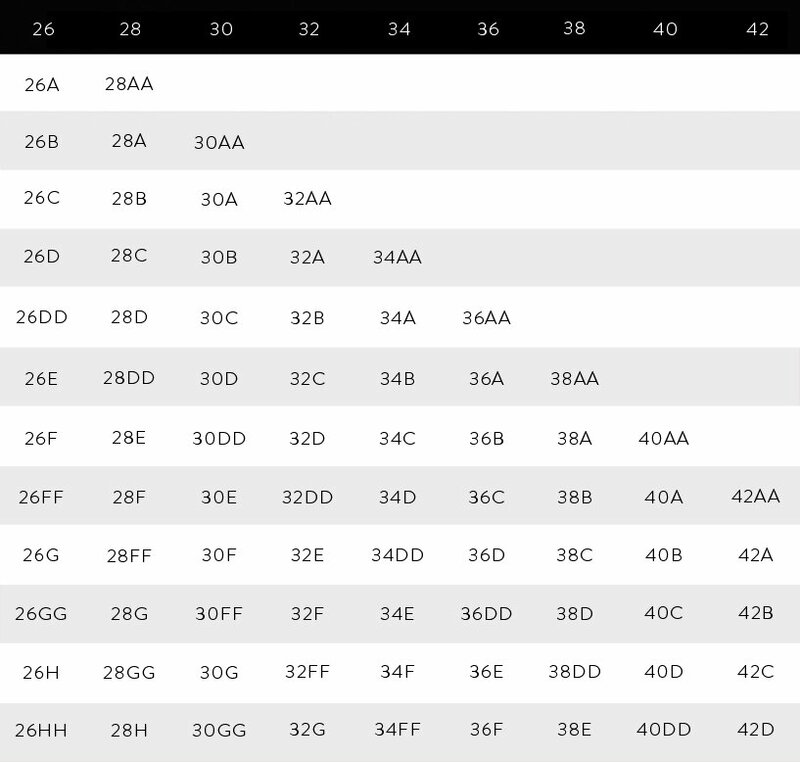 Without a back and straps, bra sizing is indeed more flexible.